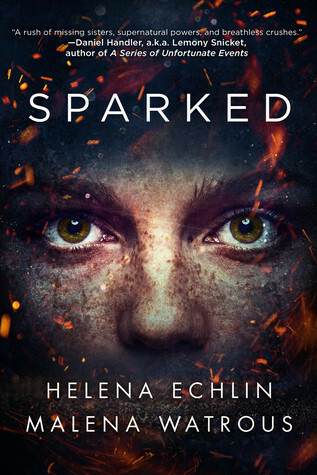 Sparked, by Helena Echlin and Malena Watrous, is a young adult urban fantasy that is a joy to read. I read a wide range of genres, including more than a few YA novels. Reading the novel, I felt it was potentially written for a younger age group than me. Before you start, yes, I know I don’t come anywhere close to qualifying as “young” adult. However, there’s a lot of YA books out there that feel they're written for a more mature group within the bracket. Or maybe they just try to be edgier. Either way, there’s something distinctly innocent about the teenagers who take centre stage in Sparked, and it fits the story well. Speaking of story, Sparked follows Laurel as she tries to work out what’s really happened to her sister, who goes missing early on. Circumstances leave Laurel convinced her sister is in danger, but no one else will believe her. As she digs deeper, she begins to discover the situation is far more complicated and dangerous than she ever thought possible. Both Helena and Malena have previously published novels, but never before together as a team. Their skill is obvious, with slick prose and well-structured scenes throughout. There’s nothing in the world or the plot that makes it stand out as something completely unique within the genre, but there’s nothing too derivative either, and the execution is excellent. My only real complaint is that when Laurel finds someone who can give her answers, those answers are a little cliched in delivery. While that small sequence pulled me out of the flow temporarily (I got back into it soon after), I suspect it wouldn’t bother its target audience as much. The rest of the novel avoids such a trap, and the supporting characters are great — indeed, the group dynamics are part of what makes the novel click. If you’re looking for a YA urban fantasy, but sick of Twilight clones packed full of Edwards, pick up Sparked. It delivers a quality story with panache and leaves the door open for more to come.